HomeUNDARK AND THE RADIUM GIRLS – LA VERNICE UNDARK E LE RAGAZZE DEL RADIO…La storia è destinata a ripetersi? UNDARK AND THE RADIUM GIRLS – LA VERNICE UNDARK E LE RAGAZZE DEL RADIO…La storia è destinata a ripetersi? [Cambiano le tecnologie, cambiano le abitudini di vita, ma la natura dell’essere umano rimane la stessa, portandolo ad incorrere nei medesimi errori. A seguire riportiamo la triste vicenda delle “Radium Girls” (“Le Ragazze del Radio”), che circa un secolo fa subirono danni gravissimi in seguito all’esposizione ad una vernice radioattiva. 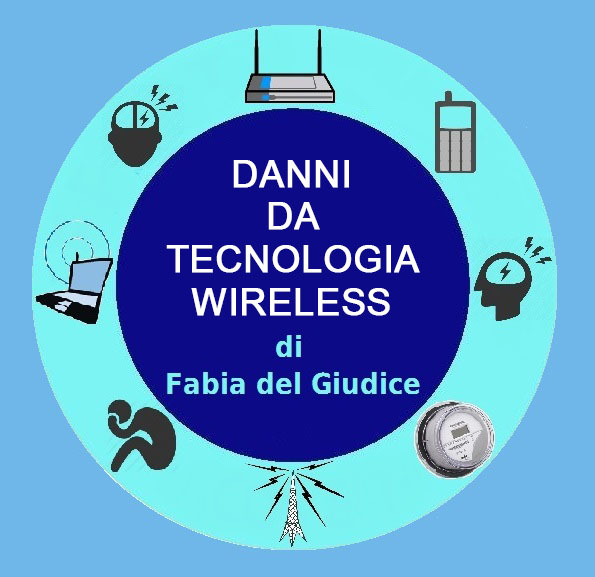 Leggendola saltano subito all’occhio le inquietanti similitudini con ciò che sta accadendo attualmente con la telefonia mobile e le tecnologie wireless: si sa che fanno male (gli studi che lo hanno dimostrato sono numerosissimi), ma chi fa business con queste tecnologie cerca di fare controinformazione e promuoverne l’uso, l’esposizione delle persone procede inesorabilmente ed alla fine ci si troverà a contare le vittime. 3) non potevano tutelarsi in alcun modo perché all’epoca non era facile reperire informazioni. 3) le informazioni sulla sua pericolosità sono reperibili online e, nell’era dell’informazione, essere disinformati può rivelarsi un peccato MORTALE. Written by Alan Bellows, copyright © 28 December 2006. In 1922, a bank teller named Grace Fryer became concerned when her teeth began to loosen and fall out for no discernible reason. Her troubles were compounded when her jaw became swollen and inflamed, so she sought the assistance of a doctor in diagnosing the inexplicable symptoms. Using a primitive X-ray machine, the physician discovered serious bone decay, the likes of which he had never seen. Her jawbone was honeycombed with small holes, in a random pattern reminiscent of moth-eaten fabric. 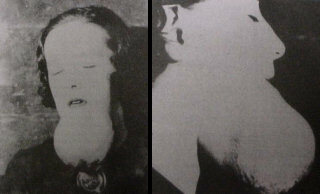 As a series of doctors attempted to solve Grace’s mysterious ailment, similar cases began to appear throughout her hometown of New Jersey. One dentist in particular took notice of the unusually high number of deteriorated jawbones among local women, and it took very little investigation to discover a common thread; all of the women had been employed by the same watch-painting factory at one time or another. In 1902, twenty years prior to Grace’s mysterious ailment, inventor William J. Hammer left Paris with a curious souvenir. The famous scientists Pierre and Marie Curie had provided him with some samples of their radium salt crystals. Radioactivity was somewhat new to science, so its properties and dangers were not well understood; but the radium’s slight blue-green glow and natural warmth indicated that it was clearly a fascinating material. Hammer went on to combine his radium salt with glue and a compound called zinc sulfide which glowed in the presence of radiation. The result was glow-in-the-dark paint. 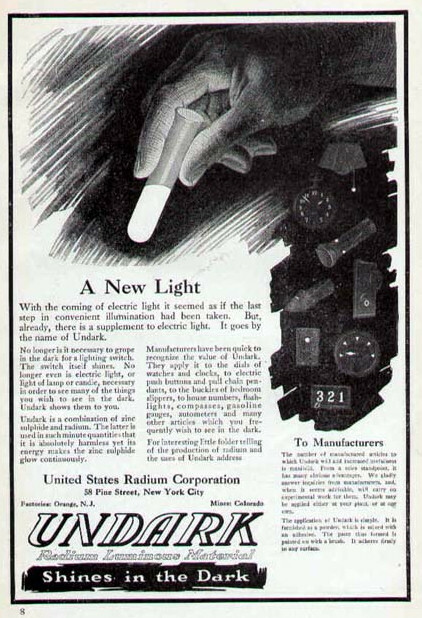 Hammer’s recipe was used by the US Radium Corporation during the First World War to produce Undark, a high-tech paint which allowed America’s infantrymen to read their wristwatches and instrument panels at night. They also marketed the pigment for non-military products such as house numbers, pistol sights, light switch plates, and glowing eyes for toy dolls. By this time the dangers of radium were better understood, but US Radium assured the public that their paint used the radioactive element in “such minute quantities that it is absolutely harmless.” While this was true of the products themselves, the amount of radium present in the dial-painting factory was much more dangerous, unbeknownst to the workers there. 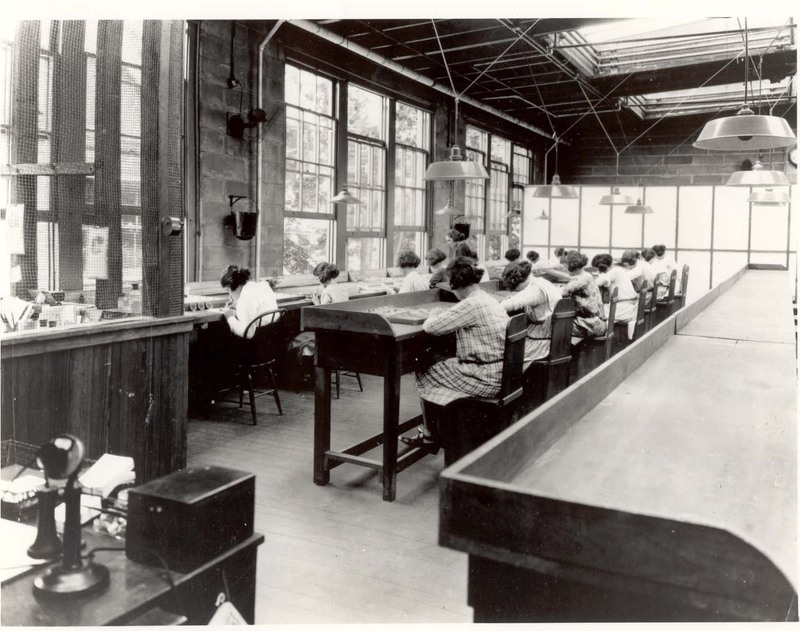 US Radium employed hundreds of women at their factory in Orange, New Jersey, including Grace Fryer. Few companies at that time were willing to employ women, and the pay was much higher than most alternatives, so the company had little trouble finding employees to occupy the rows and rows of desks. They were required to paint delicate lines with fine-tipped brushes, applying the Undark to the tiny numbers and indicator hands of wristwatches. After a few strokes a brush tended to lose its shape, so the women’s managers encouraged them to use their lips and tongues to keep the tips of the camel hair brushes sharp and clean. The glowing paint was completely flavorless [note: significant is the fact that a woman, similarly to what now happens to EHS people who have problems when exposed to EMF, gave up working with the Undark paint because unlike the others she felt a sour and highly disturbing taste when she sharpened the brush with her mouth , and this saved her life! ], and the supervisors assured them that rosy cheeks would be the only physical side effect to swallowing the radium-laced pigment. Cause for concern was further reduced by the fact that radium was being marketed as a medical elixir for treating all manner of ailments [note: at that time touted as a cure-all, it was later on revealed to be one of the worst carcinogens along with cigarette smoke!]. In 1925, three years after Grace’s health problems began, a doctor suggested that her jaw problems may have had something to do with her former job at US Radium. As she began to explore the possibility, a specialist from Columbia University named Frederick Flynn asked to examine her. Flynn declared her to be in fine health. It would be some time before anyone discovered that Flynn was not a doctor, nor was he licensed to practice medicine, rather he was a toxicologist on the US Radium payroll. A “colleague” who had been present during the examination— and who had confirmed the healthy diagnosis— turned out to be one of the vice-presidents of US Radium. Many of the Undark painters had been developing serious bone-related problems, particularly in the jaw, and the company had begun a concerted effort to conceal the cause of the disease. The mysterious deaths were often blamed on syphilis to undermine the womens’ reputations, and many doctors and dentists inexplicably cooperated with the powerful company’s disinformation campaign. In the early 1920s, US Radium hired the Harvard physiology professor Cecil Drinker to study the working conditions in the factory. Drinker’s report was grave, indicating a heavily contaminated work force, and unusual blood conditions in virtually everyone who worked there. The report which the company provided to the New Jersey Department of Labor credited Cecil Drinker as the author, however the ominous descriptions of unhealthy conditions were replaced with glowing praise, stating that “every girl is in perfect condition.” Even worse, US Radium’s president disregarded all of the advice in Drinker’s original report, making none of the recommended changes to protect the workers. US Radium was a defense contractor with deep pockets and influential contacts, so it took Grace Fryer two years to find a lawyer willing to take on her former employer. A young attorney from Newark named Raymond Berry filed the suit in 1927, and four other radium-injured dial painters soon joined in. They sought $250,000 each in damages. As the legal battle ensued, New York dentist Joseph P. Knef examined the jawbone from one of the deceased dial painters named Amelia Maggia. In the last few months of her life the bone had become so decayed that Dr. Knef had been forced to remove it from his patient. Her official cause of death had been listed as syphilis, but Knef suspected otherwise. He exposed the bone to dental film for a time, and then developed it. Patterns on the film indicated an absurd level of radiation, and he confirmed the findings with an electroscope. The national outrage over the delay prompted the courts to reschedule the hearing for early June, but days before the trial, Raymond Berry and US Radium agreed to allow U.S. District Court Judge William Clark to mediate an out-of-court settlement. Berry and the Radium Girls accepted their opponent’s offer reluctantly, despite learning that their mediator was a US Radium Corporation stockholder. Their situation was too desperate to refuse; the women were not expected to live much longer. Each woman would receive $10,000— equivalent to about $100,000 today— and have all of their medical and legal expenses paid. They would also receive a $600 per year annuity for as long as they lived. Unsurprisingly, few of the annuity payments were collected. The last of the famous Radium Girls died in the 1930s, and many other former factory workers died of radium poisoning without finding justice. Later medical research would determine that radium behaves much like calcium inside the body, causing it to concentrate in the teeth and bones. By shaping their brushes with their lips as instructed by their knowledgeable supervisors, the dial painters had ingested anywhere from a few hundred to a few thousand microcuries of radium per year. One tenth of a microcurie is now considered to be the maximum safe exposure. Marie Curie herself died of radiation-related ailments in 1934. Because radium has a half-life of 1,600 years, her lab notebooks are said to be too highly contaminated to be safely handled even today. 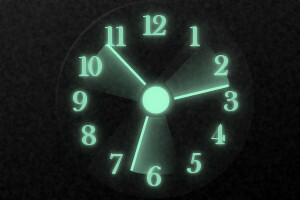 Radium continued to be used to illuminate watches until about 1968, but under much safer conditions. It is uncertain how many people were sickened or killed by Undark and similar radioactive pigments over the years, but US Radium alone employed an estimated 4,000 radium dial painters. Though they were not the only radium-painting business in the US, they were arguably the most evil. However one positive development did appear in the wake of the women’s legal struggle and subsequent media attention; In 1949 the US Congress passed a bill making all occupational diseases compensable, and extended the time during which workers could discover illnesses and make a claim. Thanks to the Radium Girls and their success in bringing attention to the deplorable conditions in US factories, industrial safety standards in the US were significantly tightened over the following years, an improvement which definitely spared countless others from similar fates. Nel 1922, una cassiera di banca di nome Grace Fryer si preoccupò quando i suoi denti iniziarono ad allentarsi e cadere senza apparente motivo. 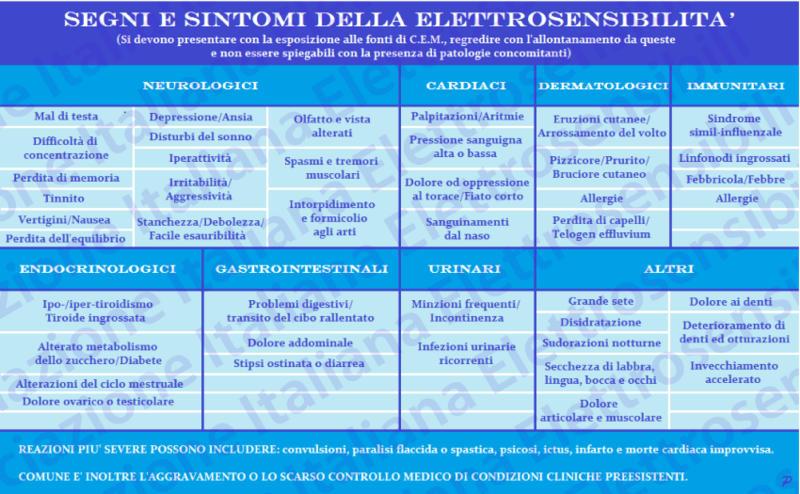 I suoi problemi si aggravarono quando la mascella divenne gonfia ed infiammata, così cercò l’aiuto di un medico per avere una diagnosi degli inspiegabili sintomi. Utilizzando un primitivo macchinario a raggi X, il medico scoprì un grave deterioramento delle ossa, ad un livello che non aveva mai visto. La sua mandibola aveva un aspetto a nido d’ape con piccoli fori, secondo un pattern casuale che ricordava il tessuto tarlato. Mentre una serie di medici cercava di risolvere il misterioso disturbo di Grace, casi simili cominciarono ad apparire in tutta la sua città natale del New Jersey. Un dentista, in particolare, prese atto del numero insolitamente alto di mandibole deteriorate tra le donne locali e gli servì una indagine molto piccola per scoprire un trait d’union; tutte le donne erano state alle dipendenze della stessa fabbrica nella quale si dipingevano i quadranti degli orologi, in un periodo o in un altro. Nel 1902, 20 anni prima della misteriosa malattia di Grace, l’inventore William J. Hammer lasciò Parigi con un curioso souvenir. I famosi scienziati Pierre e Marie Curie gli avevano fornito alcuni campioni dei loro cristalli di sale di radio. La radioattività era in qualche modo nuova alla scienza, così le sue proprietà ed i suoi pericoli non erano ben compresi; ma il lieve bagliore blu-verde del radio ed il naturale calore, indicavano che era chiaramente un materiale affascinante. Hammer combinò il suo sale di radio con colla ed un composto chiamato solfuro di zinco, che brillava in presenza di radiazioni. Il risultato fu una vernice che brillava al buio. La ricetta di Hammer venne utilizzata dalla US Radium Corporation durante la Prima Guerra Mondiale per produrre Undark, una vernice ad alta tecnologia che permise ai fanti americani di leggere di notte i loro orologi da polso ed i cruscotti. 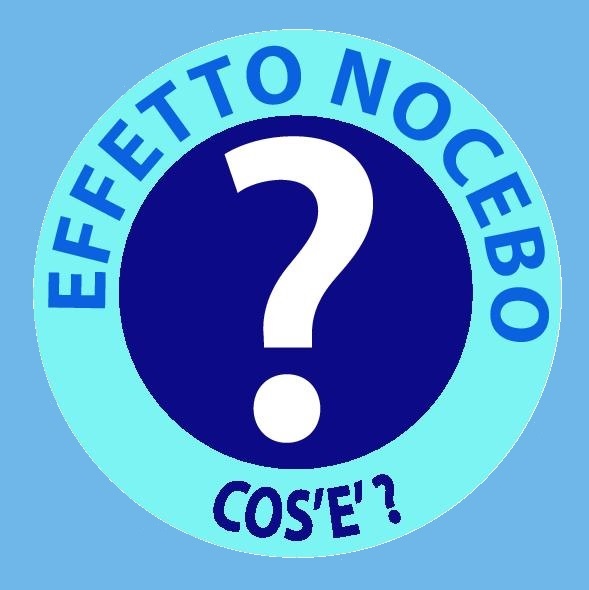 Essa inoltre commercializzò il pigmento per prodotti non militari, come numeri civici, mirini delle pistole, placche degli interruttori della luce e occhi luminosi per bambole. In questo periodo i pericoli del radio vennero meglio compresi, ma la US Radium rassicurò il pubblico sul fatto che la loro vernice utilizzava l’elemento radioattivo in “quantità così piccole da essere assolutamente innocuo”. Mentre questo era vero per i prodotti stessi, la quantità di radio presente nella fabbrica dove si tingevano i quadranti degli orologi era molto più pericolosa, all’insaputa dei lavoratori. La US Radium impiegò centinaia di donne nella sua fabbrica a Orange, New Jersey, tra cui Grace Fryer. 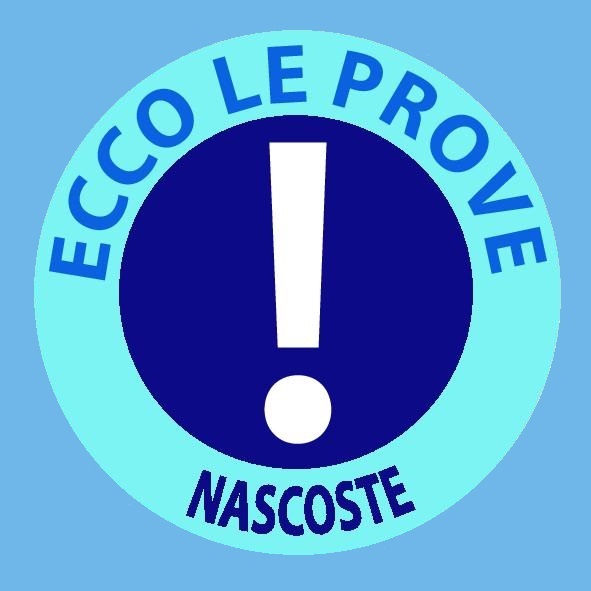 Poche aziende in quel momento erano disposte ad assumere donne e la paga era molto più elevata rispetto alla maggior parte delle alternative, per cui l’azienda non ebbe grossi problemi a trovare lavoratrici per occupare le file e file di banchi. Ad esse venne chiesto di dipingere linee delicate con pennelli a punta fine, applicando la vernice Undark ai piccoli numeri e indicatori degli orologi da polso. Dopo un paio di colpi un pennello tendeva a perdere la sua forma, così i manager delle donne le incoraggiavano ad utilizzare le labbra e la lingua per mantenere affilate e pulite le punte dei pennelli di pelo di cammello. La vernice brillante era totalmente insapore [nota: significativo è il fatto che una donna, come adesso accade agli Elettrosensibili i quali sono disturbati dai CEM, rinunciò a lavorare con la vernice Undark poichè, a differenza delle altre, percepiva un sapore acre e fortemente disturbante quando arrotava le setole del pennellino con la bocca, e questo le salvò la vita!] ed i supervisori assicuravano che avere guance rosee sarebbe stato l’unico effetto collaterale dell’inghiottire il pigmento unito al radio. Ogni motivo di preoccupazione venne ulteriormente ridotto dal fatto che il radio veniva commercializzato come un elisir medico per il trattamento di tutti i tipi di disturbi [nota: all’epoca spacciato come un toccasana, esattamente come è avvenuto per il fumo di sigaretta è stato poi rivelato essere uno dei peggiori cancerogeni per l’uomo!]. I proprietari e gli scienziati alla US Radium, che avevano familiarità con i reali rischi correlati alla radioattività, naturalmente avevano preso molte precauzioni per proteggersi. Sapevano che l’ingrediente chiave della Undark era di circa un milione di volte più attivo dell’uranio, così i chimici della società spesso usavano schermi di piombo, maschere e pinze quando lavoravano con la vernice. La US Radium aveva anche distribuito letteratura per la comunità medica che descriveva gli “effetti pregiudizievoli” del radio. Ma dentro la fabbrica, dove quasi ogni superficie scintillava per la radioilluminescenza, questi pericoli erano sconosciuti. Per scherzo, alcune delle donne si erano anche occasionalmente dipinte unghie e denti con la vernice al radio, per sorprendere i loro fidanzati quando le luci si spegnevano. Nel 1925, tre anni dopo che i problemi di salute di Grace erano iniziati, un medico suggerì che i suoi problemi alla mandibola potessero avere a che fare con il suo precedente impiego alla US Radium. Quando lei iniziò ad indagare tale possibilità, uno specialista della Columbia University di nome Frederick Flynn chiese di esaminarla. Flynn dichiarò che la donna era in buona salute. 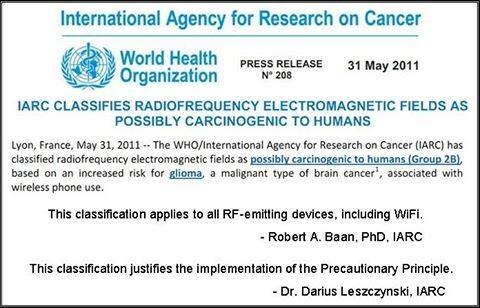 Questo un po’ di tempo prima che qualcuno scoprisse che Flynn non era un medico, né aveva la licenza per esercitare la professione medica, ma piuttosto era un tossicologo sul libro paga della US Radium. Un “collega” che era presente durante la visita– e che aveva confermato la diagnosi di buona salute– si era rivelato essere uno dei vicepresidenti della US Radium. Molte pittrici che avevano ultilizzato la Undark, avevano sviluppato gravi problemi ossei legati in particolare alla mascella e l’azienda aveva iniziato a concentrare gli sforzi per nascondere la causa della malattia. Le morti misteriose vennero spesso imputate alla sifilide per minare la reputazione delle donne e molti medici e dentisti inspiegabilmente collaborarono con la campagna di disinformazione della potente società. Nei primi anni ’20, la US Radium assunse il fisiologo professore di Harvard Cecil Drinker per studiare le condizioni di lavoro nella fabbrica. La relazione di Drinker era grave, indicando una forza lavoro altamente contaminata ed insolite condizioni del sangue in praticamente tutti coloro che ci avevano lavorato. La relazione che la società fornì al Dipartimento del Lavoro del New Jersey accreditava Cecil Drinker come autore, ma le descrizioni inquietanti di condizioni malsane vennero sostituite con brillanti lodi, affermando che “ogni ragazza è in perfette condizioni”. Ancora peggio, il presidente della US Radium ignorò tutti i consigli nella relazione originaria di Drinker, non attuando alcuna delle modifiche consigliate per proteggere le lavoratrici. La US Radium era un appaltatore della difesa con tasche profonde e contatti influenti, quindi servirono due anni a Grace Fryer per trovare un avvocato disposto ad occuparsi del suo ex-datore di lavoro. Un giovane avvocato da Newark di nome Raymond Berry presentò la causa nel 1927 e altre quattro pittrici di quadranti fosforescenti danneggiate dal radio presto si unirono. Chiesero 250 mila dollari ciascuna in danni. Mentre era in corso la battaglia legale, il dentista di New York Joseph P. Knef esaminò la mandibola di una delle pittrici di quadranti morta di nome Amelia Maggia. Negli ultimi mesi della sua vita, l’osso era diventato così decaduto che il dottor Knef era stato costretto a rimuoverlo dalla sua paziente. La sua causa ufficiale di morte era stata indicata come sifilide, ma Knef sospettava altro. Espose l’osso alla pellicola dentale per una volta e poi la sviluppò. I pattern sul film indicavano un assurdo livello di radiazioni ed egli confermò i risultati con un elettroscopio. Le donne si dimostrarono troppo malate per partecipare alla successiva udienza, che avvenne nel mese di aprile. Nonostante le strenue obiezioni dell’avvocato delle donne, il giudice rinviò il caso a settembre, perché diversi testimoni della US Radium passavano l’estate in Europa e conseguentemente non sarebbero stati disponibili. Walter Lippmann, direttore dell’influente giornale New York World, scrisse della decisione del giudice, definendola una “condannabile parodia della giustizia… Non vi è alcuna possibile giustificazione per un tale ritardo. Le donne stanno morendo. Se mai un caso dovesse andare incontro ad un rapido giudizio, è il caso di cinque donne storpie che lottano per pochi miserabili dollari per facilitare i loro ultimi giorni sulla terra “. In un successivo editoriale egli scrisse: “Si tratta di un procedimento senza cuore. E’ disumano, ingiusto e crudele. Questo è un caso che non richiede un fine contenzioso, ma una semplice, veloce, diretta giustizia”. L’indignazione nazionale per il ritardo indusse i giudici a riprogrammare l’udienza per l’inizio di giugno, ma giorni prima del processo, Raymond Berry e la US Radium accettarono di consentire al giudice distrettuale William Clark di mediare una soluzione amichevole. Berry e le “Ragazze del Radio” accettarono a malincuore l’offerta dell’avversario, nonostante avessero saputo che il loro mediatore era un azionista della US Radium Corporation. La loro situazione era troppo disperata per rifiutare; non ci si aspettava che le donne vivessero molto più a lungo. Ogni donna avrebbe ricevuto $ 10,000– pari a circa 100.000 dollari oggi– e sarebbero state pagate tutte le spese mediche e legali. Avrebbero anche ricevuto $ 600 all’anno di rendita per tutto il tempo in cui sarebbero vissute. Non sorprende che poche delle rendite annuali vennero prese. L’ultima delle famose “Radium Girls” morì nel 1930 e molte altre ex-operaie morirono per avvelenamento da radio senza trovare giustizia. Più tardi la ricerca medica determinò che il radio si comporta come il calcio all’interno del corpo, facendo sì che si concentri in denti e ossa. Nel plasmare i loro pennelli con le labbra secondo le istruzioni dei loro ben informati supervisori, le pittrici di quadranti avevano ovunque ingerito da poche centinaia a qualche migliaio di microcurie di radio all’anno. Un decimo di microcurie è ora considerato la massima esposizione sicura. Marie Curie stessa morì di malattie legate alle radiazioni nel 1934. Poiché il radio ha un tempo di dimezzamento di 1.600 anni, i suoi quaderni di appunti di laboratorio sono ancora oggi detti essere troppo altamente contaminati per poter essere maneggiati in modo sicuro. Il radio continuò ad essere usato per illuminare gli orologi fino a circa il 1968, ma in condizioni molto più sicure. Non è chiaro quante persone siano state fatte ammalare o siano state uccise da vernice Undark e pigmenti radioattivi simili nel corso degli anni, ma la sola US Radium impiegò secondo le stime 4.000 pittrici di quadranti al radio. Anche se non fu l’unico business della radio-pittura negli Stati Uniti, è stato probabilmente il più crudele. Tuttavia uno sviluppo positivo si è presentato a seguito della lotta legale delle donne e della successiva attenzione dei media; nel 1949 il Congresso degli Stati Uniti ha approvato una legge rendendo tutte le malattie professionali risarcibili e ha esteso il tempo durante il quale i lavoratori potevano scoprire le malattie e fare una domanda di risarcimento. Grazie alle “Radium Girls” ed al loro successo nel portare l’attenzione sulle condizioni deplorevoli nelle fabbriche degli Stati Uniti, gli standard di sicurezza industriali negli Stati Uniti andarono significativamente incontro ad un giro di vite nel corso degli anni seguenti, un miglioramento che sicuramente ha risparmiato innumerevoli altri/e da un destino simile. 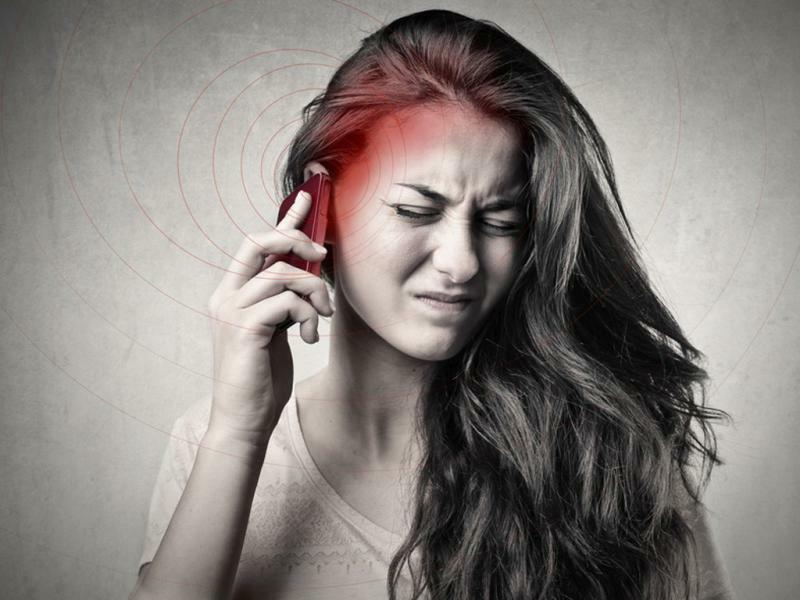 ← Long-term exposure to electromagnetic radiation from mobile phones and Wi-Fi devices decreases plasma prolactin, progesterone, and estrogen levels but increases uterine oxidative stress in pregnant rats and their offspring.